Today’s youth and amateur sports and recreation landscape is more diverse and dynamic than ever before. While this can be a benefit for people who are afforded options and opportunities to choose their activities, many “traditional” athletic facilities are struggling to maintain steady utilization, leaving operators in a reactive mode that makes programming, scheduling, budgeting and hitting the budget nearly impossible. The most successful traditional sports facility managers not only adapt to changing demands for sports programming, but work fervently to recognize trends and budding opportunities, develop new programs that make their venue an early adopter of up-and-coming sports and activities, and regularly evaluate the success of their newest programs. Before outlining how successful operators plan, implement and grow new programs, let’s first look at two driving forces shaping today’s sports landscape: changes in participation and increasing competition. The chart below shows the five-year average annual change in 14 select team sports on the national scale according to the 2017 Sports & Fitness Industry Association (SFIA) U.S. Trends in Team Sports Report. 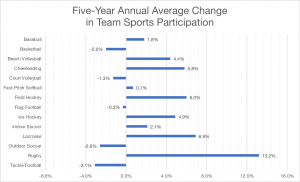 While it should be noted that there can be significant year-to-year variation in participation and that percent change is heavily influenced by the beginning gross number of players, the five-year trend demonstrates the plateaus and declines in several traditional team sports. In fact, of the 14 team sports shown, only beach volleyball, cheerleading, field hockey, ice hockey, lacrosse and rugby have grown by more than three percent per year on average since 2012. Meanwhile, several of the sports with the greatest gross number of participants have been in decline, including basketball, court volleyball, flag football, outdoor soccer and tackle football. Compounding the challenges that come along with plateauing and declining participation rates in many traditional team sports, competition is increasing from a variety of sources. In general, there are five sectors vying for participants, and each is more focused on increasing its market share more than ever. 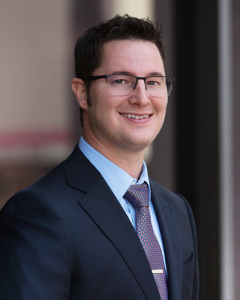 Private sector facilities, which are heavily focused on running their own “in-house” programs in order to generate the revenue necessary to cover all-time-high operating costs. Private sector programs, which have been a primary catalyst for the explosion in youth travel sports, have become increasingly bullish on securing time and space at facilities in order to increase recreational and competitive program offerings to expand their reach (and often to increase their profit margin). Public sector facilities, which are monetizing and/or privatizing their recreation services in order to improve cost recovery and stabilize shrinking parks & recreation budgets. Non-traditional sports, such as adventure sports, endurance sports, and e-sports, which are increasing their service to youth who seek competition but are not interested in traditional team sports. Non-competitive activities, such as hiking, biking, and paddling, which are being heavily promoted as active, healthy options for kids and families who are disenchanted or disenfranchised by today’s competitive sports landscape. Step 1: Track Leading Indicators – leading indicators for new sports trends often come from the top down: new Olympic sports spawn new demand across all age groups (like 3-on-3 basketball and rugby sevens); new collegiate varsity and club sports create new competitive team demand (like Quidditch and beach volleyball); new high school varsity and club sports generate recreation program demand (like Lacrosse and Ultimate). Successful operators identify and track these kinds of leading indicators to create new program options. Step 2: Socialize New Program Options – once new program options have been identified, successful operators attempt to determine demand and generate momentum for new offerings by gauging the interest of potential participants and strategic alliances. This can be done by hosting focus groups, surveying current participants, meeting with school sports administrators, coordinating with cross-town service providers who could help spur interest in the market without directly competing for participants, etc. Step 3: Create a Forecast and Select New Programs – once potential interest is understood, successful operators forecast each new program option to determine which program(s) will be implemented. In order to make a fully-informed decision, the best operators consider a variety of key requirements, projections, and metrics, including but not limited to ideal schedule to create interest, existing program displacement, start-up supply and equipment costs, number of total registrations, number of new (first-time) participants, revenue generation, cost of goods sold, etc. Step 4: Evaluate, Adjust, Assess, and Promote or Drop – once a new program has begun, successful operators evaluate the program throughout and after the first session to clearly understand drivers of success, challenges, customer satisfaction, and growth potential. After the first session, the best operators debrief with their staff, coaches, and participants to identify and communicate future changes, then work to promote the second session. After the program has concluded its second session, it can be promoted as a permanent program or dropped from the facility’s set of offerings. Sports and recreation is a dynamic industry which is constantly shifting to meet the demands of participants. The most successful operators understand the need to recognize trends, create new programs to fill their facility, and then continue to adjust the program schedule.